The Duomo, discussed previously, is the oldest building in the Piazza dei Miracoli, or rather the building whose construction started first. Numbers two and three are the Baptistery and the Leaning Tower. Almost everyone in The Netherlands knows the Leaning Tower. Not because they have all been to Pisa, but because the Tower of Pisa is a well-known game, which was also played in a quiz broadcast on national television for several years. The aim of the game is to place as many miniature men on the precariously instable Tower of Pisa without the tower collapsing or the men falling off the galleries. But I will discuss the Baptistery first, since it is the second oldest building. One of the first things to notice about this building, made completely of marble, is that it is simply huge. 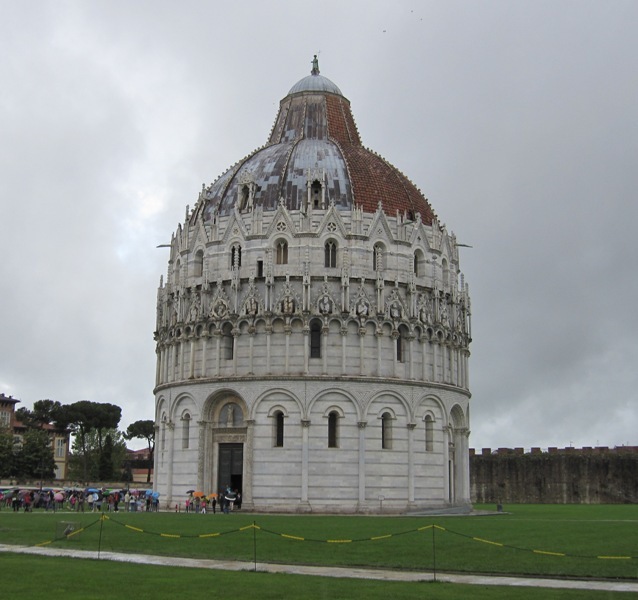 It is the largest baptistery in all of Italy, almost 55 metres high. It is topped by a statue of Saint John the Baptist, and if you count his statue, the Baptistery even stretches out a few centimetres above the Leaning Tower. The second thing to notice, is that the building is a fusion of styles. The lower part of the Baptistery is in the same Pisan Romanesque style as the Duomo, but about halfway up, the style changes to Gothic. The contrast between the former’s rounded and the latter’s pointed arches cannot be missed. The simple reason for this change of style is that the Baptistery was the result of a construction process that lasted well over 130, and perhaps even 200 years. Diotisalvi was presumably only responsible for the ground floor, and the building was already used for ceremonies when Nicola Pisano (ca. 1220-1284) and his son Giovanni (ca. 1250-1315) continued the work in the middle of the thirteenth century. Nicola also sculpted the wonderful pulpit inside the Baptistery (his son did the one in the Duomo), while Guido Bigarelli da Como was the artist responsible for the baptismal font. The statue of Saint John the Baptist is a work of bronze by the modern sculptor Italo Griselli (1880-1958). The Leaning Tower is actually the Duomo’s freestanding campanile or bell tower. It is the third oldest building in the Piazza. The fact that it is leaning has a very simple reason: its foundation is pretty bad. The foundation is just three metres deep and this was clearly not enough for the soft ground on which this very heavy tower was built. In fact, the Duomo and the Baptistery have a small tilt as well, but it is especially striking with the campanile. 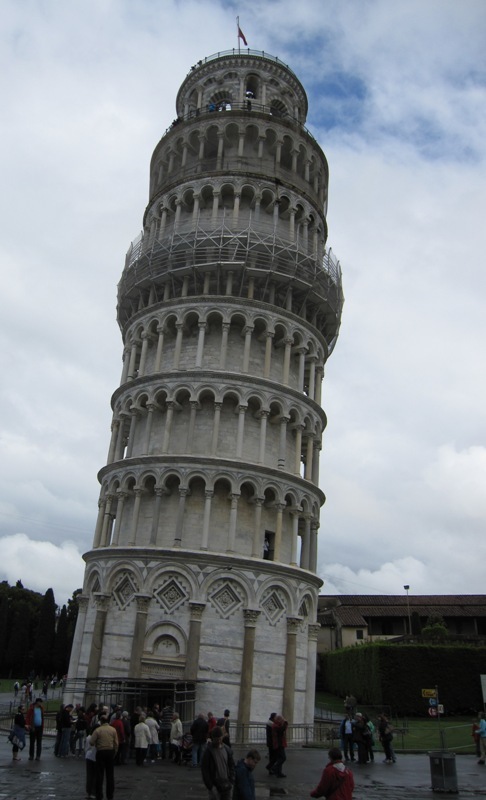 The leaning already began during the construction process and the builders had to make corrections whenever they added another floor to the tower. The first stone was laid in 1173. The original architect is actually unknown. Vasari attributed the work to Guglielmo and Bonnano Pisano, but recent research has suggested that Diotisalvi was responsible for the tower, the same man who was the first architect of the nearby Baptistery. However, the problem with this claim is that while Diotisalvi signed the Baptistery, he did not do so with the campanile. In any case, the original architect did not live to see his design being completed. The whole construction process lasted almost 200 years. The tower has seven floors, that is: a ground floor and six floors with colonnaded galleries on top of each other. The belfry at the top was completed in 1372, and with this bell-chamber, the whole building was finished. As with the Baptistery, the campanile was built in stages. The ground floor and second floor were completed by 1178, but then construction was halted because of the many wars that the Republic of Pisa was fighting against its Tuscan rivals. The building process was resumed in 1272, only to be put on halt again after the decisive defeat of the Pisan navy against Genoa at the Battle of Meloria of 1284. After the defeat, Pisa soon lost her position as a maritime power and a regional power in Tuscany. The city would be brought under Florentine control in the early 1400s, but at least the Pisans managed to finally complete their Leaning Tower by 1372. Over the centuries, the tilt became worse and worse, and there was a serious risk that the tower would fall over. As part of an April Fool’s Day prank in 1960, the Dutch news actually claimed the tower had collapsed. Between 1990 and 2001, the tower was closed to the public and attempts were made to stabilise it. These attempts were very successful and the tilt has been reduced considerably. Of course, the tilt was still kept, as it was a feature that drew thousands of tourists from all over the world. You will often see tourists getting their picture taken while pretending to be saving the tower from toppling by stabilising it with their hands.